Born in a bookstore basement and forced to compete for food with his larger and meaner brothers and sisters, Firmin the rat begins to devour his surroundings. Firmin soon realizes his source of nourishment has endowed him with the ability to read. This discovery fills him with an insatiable hunger for more books and a very unratlike sense of the world and his place in it. As Firmin navigates the shadowy streets of his decaying 1960s Boston neighborhood, looking for love and understanding, his excitement, loneliness, fear, and self consciousness become remarkably human and undeniably touching. Through a series of misadventures and against a backdrop of urban destruction, Firmin is led deep into his own imaginative soul –a place where Ginger Rogers can hold him tight. Brilliantly original and richly allegorical, Firmin is brimming with charm and wistful longing for a world that understands the redemptive power of literature and treasures its seedy theaters, one-of-a-kind characters, and cluttered bookstores. Sold to more than 20 languages! 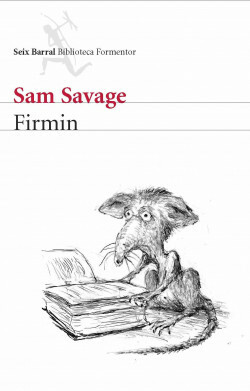 "Firmin is a hero in the Dickensian mode… with the sardonic shadings of Vonnegut, and the same explicit tenderness… Savage has captured the essential tragedy of a world in which the artistic impulse kneels before the bulldozer. …. [A] moving and wildly inventive novel." Los Angeles Times Book Review. "Every booklover will want to have [Firmin] on his or her shelf." -JANIS FRAME, Book Buffs, Ltd.
"A cleverly written memoir of the colorful lives and distinct shops of a Boston borough… Recommended for many collections." -Library Journal. "A rat’s life may be brutish and short, but not necessarily without style." -Kirkus Review. "A profound study of alienation and the heartbreaking obscurity of the outsider, Firmin is also a piercing commentary on the human condition in an ever-changing society. Savage weaves an inventive and dreamlike tale, by turns hilarious and startlingly moving, completely outlandish yet utterly credible, and sure to bring a smile of deep satisfaction to its readers." -Barnes & Noble. "Delicious. Firmin is a book that is written for Readers, that is, for people who have the book passion and for whom books are as real as anything else in life. Realer, perhaps." -DONNA LEON. Orion Books (UK), Bantam Dell (USA), Einaudi (Italy), Actes Sud (France), List (Germany), Signatuur (The Netherlands), Planeta Manuscrito (Portugal), Planeta Brasil (Brazil), Wisdomhouse (Korea), Livanis (Greece), Kinneret- Zmora-Bitan (Israel), Wydawnictwo Literackie (Poland), Polirom (Romania), Crown (Chinese Complex), Yilin Press (Chinese Simplified), Ozgur Publishing (Turkey), Vaga (Lithuania), Carobna Knjiga (Serbia), Janet 45 (Bulgaria), Európa Kiadó (Hungary), Inostranka (Russia), Gamme (Thailand), Animar (Egypt), Columna (Catalan).